Reba McEntire – part of the longest-running country act in The Colosseum at Caesars Palace’s history Reba, Brooks & Dunn: Together In Vegas – officially welcomed The Voice to town during a surprise appearance last night (Tues, Dec 5th). The NBC hit show’s alumni Alisan Porter, Chris Mann, Matt McAndrew, Matthew Schuler, Mary Sarah and winner of Season 13 will embark on The Voice: Neon Dreams next Spring for their first-ever Vegas residency. Tickets for performances are on sale now and can be purchased at TheVoiceVegas.com. The news come during an exciting week for Reba, who was nominated for the GRAMMY Awards Best Roots Gospel Album with her first-ever inspirational project, Sing It Now: Songs of Faith & Hope (Nash Icon Records / Capitol Christian Music Group). The double-disc collection was already named GMA Dove Awards Bluegrass/Country/Roots Album of the Year and topped both the Billboard Country and Christian/Gospel charts for multiple weeks, marking her thirteenth summit. Reba appears on The Talk this Friday, December 8tg as guest co-host alongside show hosts Sharon Osbourne, Julie Chen, Eve and Sheryl Underwood, airing on CBS at 2 pm ET/PT. In addition to her record of 35 No. 1 singles and over 56 million albums sold worldwide, Reba has been honored with numerous accolades from AMA, ACM, CMA, GRAMMY, People’s Choice Awards and more. The Cowgirl Hall of Fame, Grand Ole Opry and Country Music Hall of Fame member also hosted CMA Country Christmas for the first time, resulting in a three-year ratings high across broadcast and social media. 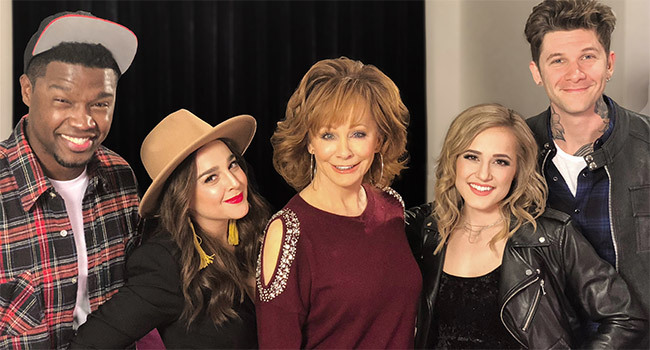 The festivities will re-air Saturday, December 23rd at 8 pm ET/PT on ABC with Reba performing holiday selections featured on her album My Kind Of Christmas, out now.